Emily Thomas Glaser, 40, of North Ridgeville, died Sunday January 27, 2019 at her home while surrounded by her family after a long illness. She was born February 28, 1978 in Butler, Pennsylvania and had resided in North Ridgeville since 2001. Emily graduated from Butler Senior High School in Butler, Pennsylvania where she participated in the Sequinette Dance Team. She attended Westminster College in New Wilmington, Pennsylvania where she was a member of the Alpha Gamma Delta Sorority and graduated with a degree in Public Relations. After moving to Ohio, she attended Cuyahoga County Community College where she studied nursing and then earned her BSN in Nursing from Ohio University. 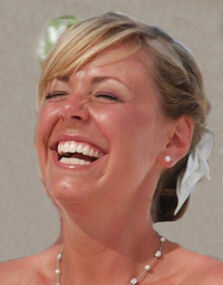 Emily worked as a Registered Nurse in the Trauma ICU at Metro Health Medical Center in Cleveland for over 13 years. She enjoyed exercising, running 5K marathons and was a Beach Body coach. She had a wicked sense of humor and was an avid Pittsburgh Steelers fan, Ohio State Buckeye fan and NASCAR fan. She is survived by her husband of 9 years Steve Glaser; children: Katherine, Paul & David Glaser, all at home; mother Rebecca Thomas (nee Sheavly) of State College, Pennsylvania; sister Sarah (Bob) Zipf and their children John & Thomas Zipf, all of State College, Pennsylvania; sister Rachel (Jared) Brunswick and their children William & James Brunswick, all of Birmingham, Alabama; father-in-law and mother-in-law Paul & Elaine Glaser of Lorain; sister-in-law Sue Glowacki and her children Lauren, Morgan & Ryan Glowacki, all of Amherst and many aunts, uncles and cousins. She was preceded in death by her father David Thomas in 1991 and her maternal and paternal grandparents. The family will receive friends Friday February 1st from 9:30 am until the time of the funeral mass at 10:30 am at St Peter Parish, 3501 Oberlin Ave, Lorain. The Rev. Craig Hovanec, pastor, will preside. Memorial contributions can be made to the family to establish college accounts for her children or to Hospice of the Western Reserve, 17876 St. Clair Ave, Cleveland, Ohio 44110.